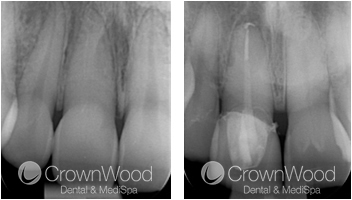 Endodontic treatment is one of our specialities at CrownWood Dental. Endodontics is a skilled and time-consuming procedure. It is so intricate that magnification should be used to maximise success. 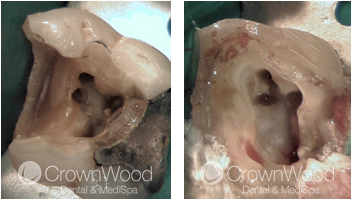 At CrownWood Dental, we have invested in a dental surgical operating microscope. We also have the latest reciprocating rotary driven motor helping to reduce the incidence of fractured instruments. 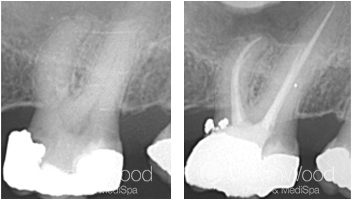 Root canal are obturated using thermal obturation filling methods and also we use digital radiography to aid diagnosis and reduce radiation. We have also recently purchased a Satelac P5 ultrasonic machine which has made finding sclerosed canals easier and assists in post and instrument retrieval. 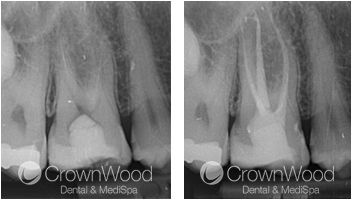 Endodontic referrals are carried out by the CrownWood Dental Endodontic team made up of Dr Rupinder Reel and Dr Pavan Gogna. Rupi qualified as a dentist at Liverpool University in 1997. She gained experience working in both general dental practice and hospital environments, developing expertise in Oral and Maxillofacial Surgery. 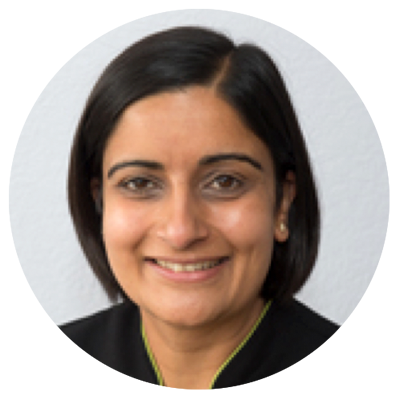 In 2003, Rupi attended Guy’s Hospital for postgraduate training in Endodontics and since qualifying as MRD RCS (Eng), she has specialised in Root Canal Treatment. Rupi has a very open and engaging personal style and she prides herself on providing the very highest standards of care and attention in addition to clinical excellence. In her spare time, Rupi enjoys cooking, travelling and spending time with her family. Pavan qualified as a dentist in 2003 from Guy’s Hospital with Honours, which then allowed him to complete his vocational training in Chingford under the watchful eye of Dr Raj Gogna (no relation), who is a leading Specialist in Prosthodontics. 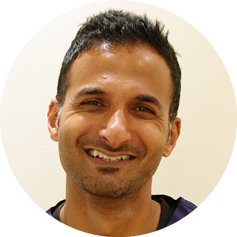 Following completion of his VT year, Pavan attended numerous courses and developed a keen, special interest in Root Canal Treatment (Endodontics). He has been accepting referrals for over 8 years. He particularly enjoys performing Root Canal Treatment because it is so detailed and because it means he can help save patients’ teeth. He uses state-of-the-art technology and equipment to include a dental operating microscope, the latest filling techniques and sedation for anxious patients. Pavan’s approach is that no case is considered too small and he is always on hand to speak to any dentist considering referring and to offer any helpful advice to them. Pavan also welcomes referring dentists to accompany their patients if they have a special interest in their case. In his spare time, Pavan loves playing a variety of sports, especially football. Socialising with friends and family is very important too, and Pavan also enjoys reading. Pavan currently accepts referrals for endodontic consultations and investigations, primary RCT, secondary RCT, post placement and post removal. Currently he does not accept cases requiring apical surgery as often with these cases root canal retreatment works better or other options should be considered. For £35 he offers a consultation appointment. This includes a full assessment, all necessary radiographs, details of treatment required, full costs and consent. After this a report of this appointment is also sent to you returning any original radiographs you have sent. The cost of treatment includes all necessary appointments, all necessary radiographs, a permanent core and follow up appointments after 1 week, 1 year and 4 years. This ensures a complete comprehensive management of the treatment and the patient. 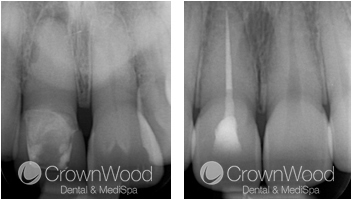 Once the root canal treatment is completed Pavan usually provides a permanent core unless specified. All patients are returned to the referring dentist for the provision of the cast restoration. If crowns have to be removed or bridges sectioned then Pavan provides all forms of temporisation. If you have a patient who needs Root Canal treatment, please fill in our Online Referral Form or download our Freepost Referral Form. We also welcome walk in and self referrals please ask for Dr Rupinder Reel or Dr Pavan Gogna.